Russia’s PAK-FA project has resulted in the less than stealthy looking T-50. In the past few years of its development, the aircraft has experienced several nosedives following which both Russia and India – its main backers – have scaled back their original plans to acquire hundreds of these jets. By serving a warning to Lockheed-Martin over its cash-bleeding F-35 stealth fighter, Donald Trump has focussed attention on the trillion-dollar scam going on in the name of American national security. At the same time, the new U.S. President’s pot shots at the American fighter come at a time when stealth programmes worldwide are in trouble. While the F-35 programme has already swallowed a trillion dollars – which is equal to the GDP of Australia – the Russian T-50 is also experiencing take off issues. The Chinese J-20 and J-31 parallel stealth programmes are shrouded in secrecy but China’s purchase of the expensive Russian Su-35 jet fighter is an indication that Beijing’s birds are not quite ready to fly out of their nests. The first indication of trouble on the stealth front came in 2011 when the U.S. Air Force shut down the F-22 assembly line after cranking out just 187 aircraft. This is an exceedingly small number of air defence fighters for a country of America’s size and air defence requirements. Although the jet’s capabilities are highly classified, there have been several leaks about its “major structural flaws”. Worse, when the aircraft entered service in 2005 it had a fleet availability of just 40 per cent. Translation: barely 88 F-22s were mission capable at any given time. It took several billion dollars worth of upgrades and 10 years of work to increase the fleet availability to 63 per cent. Further trouble with stealth jets came in 2014 when it was revealed the U.S. Navy was going to buy 22 additional EA-18G Growler electronic warfare (EW) aircraft for $2.14 billion. The U.S. Navy uses the Growler EW aircraft kitted out with advanced radar jamming equipment to protect its fleet of F/A-18 aircraft during missions. Now, the F-35 is fitted with its own EW capabilities and its supporters say a separate jamming aircraft is not needed because of this technology. But according to others in the U.S. Navy and industry, the F-35's stealth and EW capabilities are simply not enough. According to Air Force Technology magazine, "It is an admission that the U.S. Navy is not entirely comfortable with the F-35's capabilities in Anti-Access/Area Denial environments." The purchase of more Growlers is seen as the U.S. Navy's "escape hatch" from the unpopular F-35 programme, which has historically received a lukewarm reception from some sections of the service. In a May 2014 article for Air & Space Power Journal, a senior U.S. Air Force officer questioned the F-35's capabilities and said there were good reasons to cancel the programme. "Even if funding were unlimited," Colonel Michael W. Pietrucha wrote, "reasons still exist for terminating the F-35." He added: "Our assumptions about the operational environment, made more than a decade ago, do not match the current reality.... The mission of the aircraft – to penetrate the most advanced air defences and drop precision-guided munitions on critical targets of a peer adversary – remains questionable at best." The F-22’s replacement has thus turned out to be another white elephant, with a myriad of issues that have eroded user confidence. The Chinese are treading a new path when it comes to stealth by developing two separate aircraft by entirely different bureaus. It appears that while the J-20 is meant for the People’s Liberation Army Air Force (PLAAF), the J-31 is aimed at the export market. However, despite the U.S. Department of Defence warning that these aircraft could enter service as early as 2018, it appears that the Americans are hyping up the Chinese threat. Beijing’s decision to acquire 24 advanced Su-35 Super Flankers from Russia is a clear sign that all is not well with the development of the J-20 and J-31 – both based on designs stolen from the US. Despite the Chinese showing off their stealth jets, the doggedness with which they have pursued the Su-35 and begged and cajoled the Russians to sell them the Super Flanker points to serious shortcomings in their stealth aircraft programmes. It seems the only reason to buy the Su-35 as a stopgap arrangement is to steal its engine technology. Currently, the Chinese jets are powered by Russian power plants meant for non-stealth jets. Since these engines are not able to supercruise – sustain supersonic speed without engaging afterburners – which is a defining aspect of stealth, the Chinese have chosen the sensible way of falling back on 4.5 Generation jets. 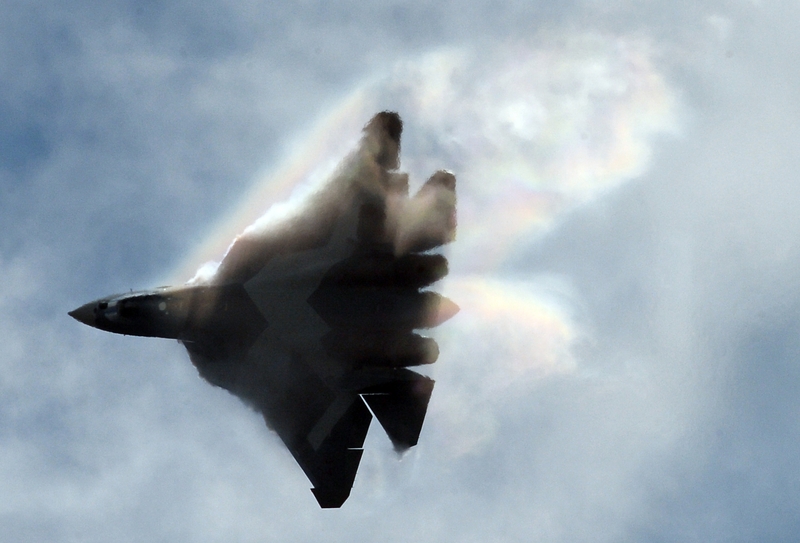 “By delaying large-scale acquisition of the Sukhoi T-50 fighter, the Kremlin is tacitly acknowledging a truth that the U.S. military learned decades ago – and that China might also learn in coming years: developing stealth fighters is hard,” says David Axe, who edits War is Boring. Like China, Russia too has decided to find comfort in 4.5 Generation aircraft, with no or some stealth features. The Su-35 and Su-30SM (based on the Indian Air Force Su-30MKI) are the two warplanes that with fill in the gaps vacated – for the time being – by the T-50. The American solution to this conundrum is using stealth jets to lead older generation – but still potent – jets into combat. For instance, upgraded F-15s – the most advanced non-stealth jet in the USAF – could follow the path cleared by the F-22. Says Axe: “Radar-evading warplanes require careful design work, extensive testing and exotic materials for their construction — all features that can double or triple their cost compared to conventional, non-stealthy planes. “Even with their high cost, air forces all over the world are scrambling to acquire stealth aircraft because their ability to avoid detection can, in theory, offer a big advantage in air-to-air combat and during bombing runs. Rakesh Krishnan Simha is a New Zealand-based journalist and foreign affairs analyst.